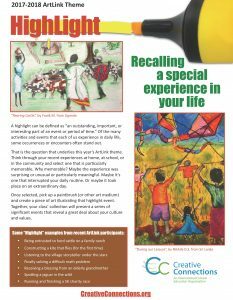 A highlight can be defined as “an outstanding, important, or interesting part of an event or period of time.” Of the many activities and events that each of us experience in daily life, some occurrences or encounters often stand out. That is the question that underlies this year’s ArtLink theme. We ask you to think through your recent experiences at home, at school, or in the community and select one that is particularly memorable. Why memorable? Maybe the experience was surprising or unusual or particularly meaningful. Maybe it’s one that interrupted your daily routine. Or maybe it took place on an extraordinary day. Once selected, you will then pick up a paintbrush (or other art medium) and create a piece of art illustrating that highlight event. Together, your class’ collection will present a series of significant events that reveal a great deal about your culture and values.